We have already explained here why the argument presented by the Mayor of Versailles claiming the Schéma directeur de la région d’Ile-de-France (SDRIF) as a truly restrictive document cannot be taken seriously. 1. Aerial view of the west side of the Versailles Domain. In blue : the 1685 wall preserved for the most part. In red : enclosure wall of Pion barracks built in 1906.
belonging to the Etablissement public de Versailles (ill. 4). 2. Schéma directeur de la region d’Ile-de-France. General dispositon for ground areas. In salmon : “urbanized space”. “woods or forest”. Light green : “Landscaped or green space”. 3. PLU approved on 24 November 2011. Zoning plan for Pion sector. City Hall states furthermore, in its response, that "According to the orientations and measures of the SDRIF, the Pion sector is partly in an ’urbanized space’ and partly in a ’space which can be urbanized’ ". However, the second half of this statement is false. 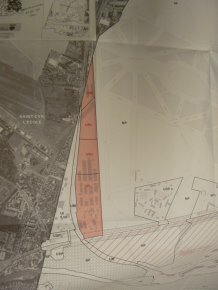 The middle section of the Pion site "can be partially urbanized" only, as stipulated in the SDRIF, which is not the same thing as "can be urbanized" alone (in the first case, the legend shows the white and orange lines, in the second, white squares on an orange background : see legend)... City hall simply made a mistake when consulting the SDRIF map, although it considers it the final authority. This is pushing it a bit too far ! Another question now arises : can a plot of land allowing only 20% of full ground spaces  (mainly for vegetation camouflaging on the perimeter of the site) really "be partially urbanized" ? We firmly doubt it. built in 1906, and the Accroissement tree lane (on the right). This is a “space which can be partially urbanized” on the SDRIF. The Etoile Royale is at the end of this perspective. A plane is about to land at the Saint Cyr l’Ecole airfield. 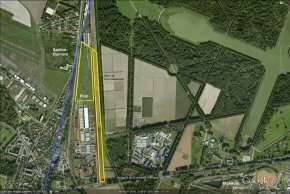 We can also see that the SDRIF considers as a "space which can be partially urbanized" a strip of land falling between route D10 and the point of the Pion site (ill. 2). 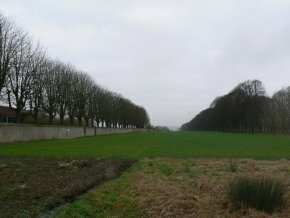 This listed land, belonging to the Etablissement public de Versailles (EPV), is located between the perimeter of the Pion barracks and the Accroissement tree lane (ill. 1 and 4). City hall, which claims it is compelled by the SDRIF provisions, should consequently classify it in zone U (urban)... It has not done it since the PLU places this long strip of land in a natural zone (ill. 3, zone NP). The city is thus contradicting itself again as it did on the subject of the land at Mortemets (see article) . However, will it use the SDRIF argument one day in order to urbanize it and eat away a bit more at the Domaine national de Versailles ? there is “modification of its use” by the INRA. Also, we do not understand either, given the guiding principles which the city claims to follow, why the INRA lands, placed by the SDRIF in the category of "landscaped or green space" (ill. 2), can be urbanized in the PLU (ill. 3, zone USPa). 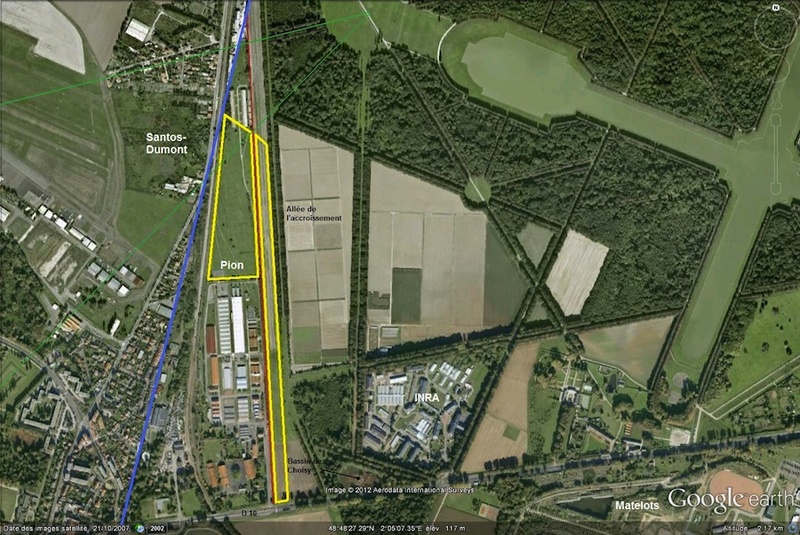 The SDRIF classification is understandable as the INRA site, listed as a historical monument and urbanized after the war against the wishes of the French Ministry, has been promised to the EPV  which should, eventually, return it to nature. For this reason, it would be wise to prevent the further densification of this part of the park, so close to the Grand Canal and adjacent to the Choisy pond (ill. 5), whereas the PLU grants its authorization without setting any real limits . We see that City Hall ignores the SDRIF so often that its claim affirming that it follows its provisions blindly is blatantly deceptive. The principle of free management of local communities, establishing their autonomy as relates to the SDRIF, can be used almost systematically in the same sense. In this way, the SDRIF is observed when it seems to justify the urbanization of the Domaine (which is not true for all of the zones listed as historical monuments : see article) but is ignored when it opposes it (the lands at Pion which are not urbanized) ! 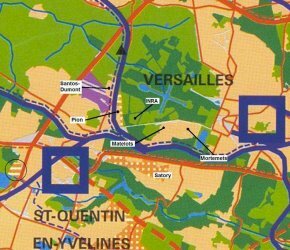 We can see also that it is particularly urgent to reexamine the status of the land areas in the Domaine national de Versailles... Such a lack of precision, in such an important location for national heritage and so coveted by all sorts of developers, is far from being reasonable. File of public inquiry approved by the Municipal council on 24 November 2011. 3a - Regulations. Written rule, p. 291, art. UR 10-2 and 9-2. We are using the figures provided for the overall sector of Pion, as the zone URb has not received any particular restrictions on the subject. File of public inquiry approved by the Municipal council on 24 November 2011. 3a - Regulations. Written rule, p. 298, art. UR 13-3 : "20% of the land area must be arranged in full ground landscaping". 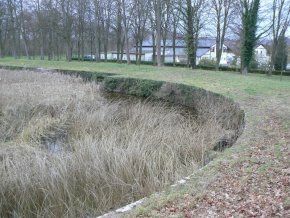 We should recall that, considered as a "space which can be urbanized" by the SDRIF (ill. 2), the land at Mortemets was placed by the PLU in a natural zone (NP), a measure rendered nonsensical by the creation of a sub-zone (NPa) authorizing almost restriction-free urbanization (see article). However, this "urbanized" zone as defined by the SDRIF belongs to a natural zone in the PLU, a change in status which the city claims is impossible. See here (art. 8 al. 2 and annex, parcel BY 30). The PLU, which was not revised on this point, should have been modified in favor of heritage preservation. It unfortunately provides for new construction "linked to agricultural activity or agronomic research, if [they] are compatible with the enhancement of the Domaine Nationale" (art. UPS 2. 2., p. 302), which does not mean anything, except taking "enhancement" in an economic sense. Furthermore, "The height of the buildings cannot exceed that of the existing buildings" (art. UPS 10.2, p. 309), which are, in the case of the largest ones, much too high. Neither the plot ratio (art. UPS 9, p. 309), nor their density (COS) (art. UPS 14, p. 315) are regulated, the PLU simply limits itself to providing that "In the UPSa sector, the choice of installing new constructions and the size of their volume should respect the balance of the composition of the château’s park" (art. UPS 11. 1, p. 310)... We should also point out that the INRA is the principal "partner" of the project "le vivant et la ville" planned by the city, a commendable undertaking, on condition that it is not in detriment to the park itself : see here. SDRIF, p. 303. See here.